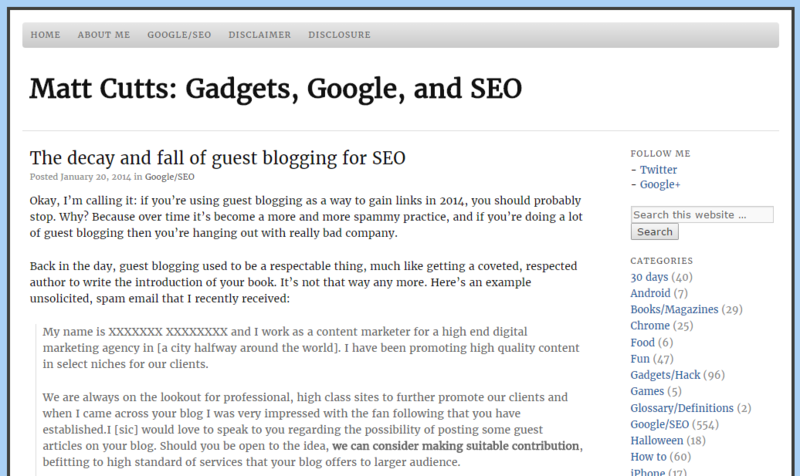 Guest Blogging - Not Just A Good Strategy ... It is Mandatory! Guest Blogging is a strategy that is as old as blogging itself. But in recent years it was often questioned whether it is still a valid strategy for building web traffic for websites, blogs and Web businesses of any kind. How Did Guest Blogging Start? Guest Blogging wasn’t invented by marketers – it was born out of the need of early bloggers to connect and interact with each other. The blogosphere in the early days (click the link to learn about the history of the blogosphere on Wikipedia) started without huge social networks like Facebook and Twitter to manage their interactions and the blogging community built itself around the blogs they created. If you wanted to interact with another blogger openly you had two choices: write a comment, or write a guest post on his/her blog. The blogging community back then was small and guest posts were a necessary feature to keep the community alive. And when the community grew in size, guest blogging stayed a part of it. Just like to this day commenting has stayed a part of blogging. But as always, once marketers find a community to be of value to them, they break it… or at least they damage it. When Google started to revolutionize searching on the web, everything changed. Not just blogging. Everything. Google changed the way we think about information, how we search for information and how much we think information is worth. They did so by revolutionizing how we search and find information on the web. The main innovation of Google’s first search engine was that it made the ranking of search results dependent on how many backlinks a site and a piece of content on the web had. Therefore the more backlinks your site had, the more people would find your content because it would be ranked higher in search results. This principle is still valid to a certain degree today. In the beginning, just a few links were usually enough, then it got harder and harder. The fight was on. Today, marketers do amazing and horrible things to get a few backlinks. And one of these things is guest blogging – in good and bad ways. There is the legitimate type of guest blogging in which you generate links by writing quality posts for other blogs and place a link to your site in your author bio of a link to quality content in your post. If you are willing to work hard you can build a tremendous amount of links this way and benefit your SEO massively. – Hiring cheap staff to create content with a lot of keywords and then getting it published by paying bloggers to publish it. – Stealing content others have already published. – Have a computer program change certain words in one piece to make it appear as a new piece to trick search engines into believing it’s actually a new piece of content. Marketers have even gone so far to create whole networks of sites with garbage content that interlinked between each other so that they could use these link networks to rank their real sites higher on search. These would automatically publish “guest posts” between each other to fake human activity and organic link profiles. That is all part of what has given guest blogging a bad name in recent years. Don’t get me wrong: when I say that guest blogging is mandatory for many Web marketers in 2016, these strategies are not what I mean! These are blackhat SEO. However, I also won’t lie to you: these techniques do sometimes work really well, at least for a short amount of time. In the long run they will lead to your site getting deleted from Google’s index. Spamming the web with loads of bad content is not a long term strategy! Why Was “Good” Guest Blogging Dragged Into The Dirt As Well? Even today, more than 2 years later I cannot get over the immense unfairness that Matt has shown in this original post. Instead of banning shady guest blogging techniques and stating best practices, Matt Cutts simply identified one of the main organizational and communicational tools of the blogosphere with webspam and blackhat strategies. It’s like burning a library because you believe your daughter is reading too many teen vampire novels. Matt’s article did a lot of damage and still does today. The problem was that he didn’t differentiate between legitimate and illegitimate guest blogging. With one blog post, Matt Cutts basically gave everyone the impression that guest blogging itself was a bad strategy and that Google would therefore downrank any sites that built links this way. Together with Google’s algorithm updates panda and penguin most people became scared of guest blogging as a strategy. So, what Matt really did was declare large parts of the blogosphere to be illegitimate blackhat SEO practitioners for using what had always been one of their normal forms of communication. Why did he choose to do that? You see, back then, and even today, Google has a problem: The amount of content on the web is growing exponentially, and Google had a hard time trying to keep up with providing relevant results with their search engine. And with the amount of content the strategies that people employed to get their content to rank expanded drastically as well. Some of the strategies people use for building links are easy to identify with an algorithm. Others are really hard to identify via technology. Differentiating between legitimate guest blogging strategies using great original content and spammy guest blogging strategies is probably very hard on an algorithmic basis. So what Google tried was just declare the whole thing as illegal and hope they would get the problem fixed that way. At least that is my theory but of course I cannot prove that. However: What I can prove is that Matt’s claims were completely false. 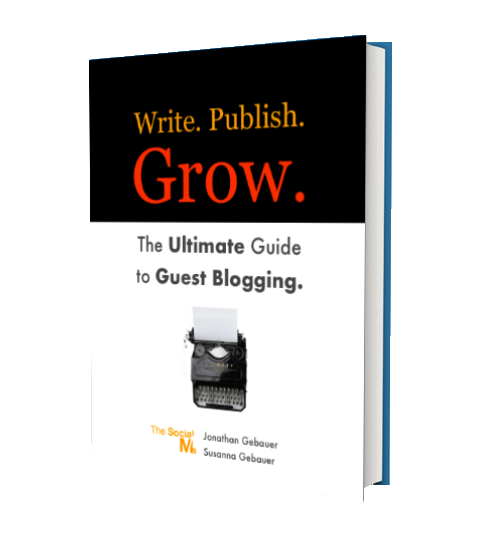 Guest Blogging is to this day a completely healthy strategy that still works well. In fact some people (including myself) suspect that many actions even against spammy link networks by Google are not algorithm based but in fact manual actions. See here for some case studies from 2016. Matt Cutts has never apologized for what damage he did. Of course, Google didn’t benefit from this at all: In the end, blackhat SEO stayed the same or at least adapted quickly while good content remained unpublished because people were afraid that publishing the content on another persons blog would damage their search rankings. So, It Is Still Working… Why Should It Be Mandatory? It’s 2016 and we’re running out of good and working whitehat SEO strategies. Google folks have optimized their algorithms quite a bit, but that isn’t the main reason for this! The main reason is that the amount of content in about any niche had grown immensely – and with that immense amount of content on the web, so has the competition for the top search rankings and backlinks. To be able to generate traffic on scale today, we now need to use strategies that don’t just build links, but also work on a social level – building our authority and reputation. And there are only few of these strategies. 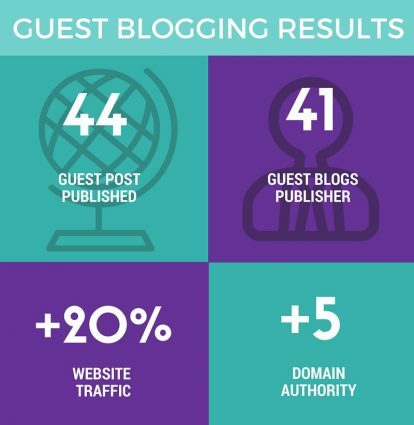 One of the most effective ones is guest blogging! When you are able to post great content on other people’s or company’s blogs you do that not just for links – you actively build your community by employing a strategy that has always been part of what made the blogosphere great. However, what is keeping many people from actually doing it these days is not Google and Matt Cutt’s post from over 2 years ago. At least not directly. What is keeping them is that they have the wrong expectations! As you can see referral traffic per post in the first 7 days after publication is often very low (keep in mind that these posts were published on top blogs from the niche). That may seem like an argument against guest blogging. 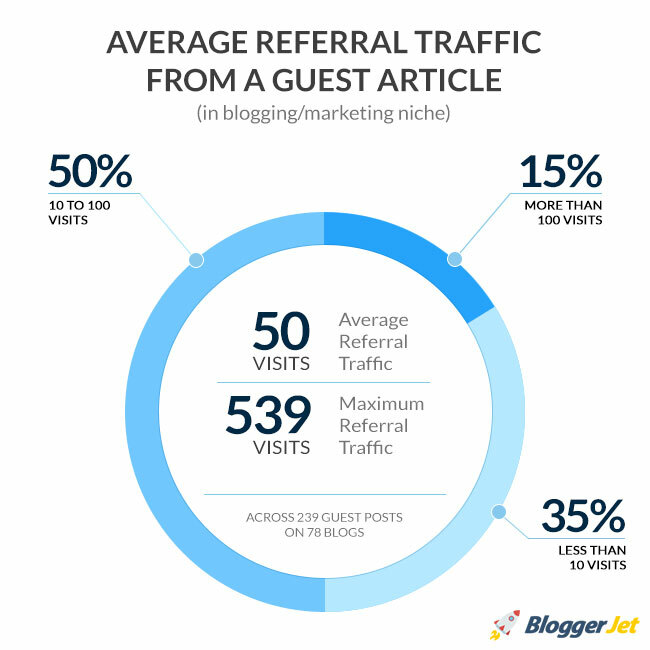 But instant referral traffic is not what you are primarily after when you are running a guest blogging strategy. Neither is it instant SEO traffic. Instant SEO traffic simply doesn’t exist. Search engines need time to decide to open the floodgates and send SEO traffic in masses to your site! Everything happening instantly when you are guest blogging is a bonus. The more you post on blogs from your niche, the more accepted as a brand you’re own blog becomes. People will recognize you when they see you on other blogs and at some point their mind will make the connection that you are an authority on your field. You can intensify this effect by talking on the comments on your guest posts. While they are interrelated, content marketing and SEO are not the same thing. Content marketing is the marketing strategy where you constantly push out great content to your target audience to become known for helpful content. Every content marketing strategy needs to be combined with a distribution strategy – and guest blogging is a great way to distribute content! This is also a great part of a valid guest blogging strategy: building links to your site that benefit your SEO. Posting on other outlets online also means that you benefit from their social audience. And since all of these blogs probably spent a lot of time in the past to grow their audience, these benefits can be huge! It’s the combination of these 4 aspects, that make Guest Blogging such an amazing way to grow your Web business’ traffic. It is the only strategy that I know that combines these corner stones of online marketing this effectively. This is why I believe that guest blogging should be seen as a mandatory strategy for most online businesses in 2016. But all of these are long term effects, a single back link, 20 referral clicks or 5 Facebook fans are not what you are really after. Just picking out case studies wouldn’t make this post very practical – so here we go: Here is how you should start your guest blogging endeavor if this article has got you in the mood for it. Here are step-by-step instruction to implement a guest blogging process into your own daily (or weekly) routine. First you should research a list of blogs from your industry and niche: don’t just focus on high authority blogs but also on those which maybe just have a lower authority but a very targeted community. When you start a guest blogging strategy it can be a good idea to start with smaller blogs and “write your way upwards” – instead of starting with the big bloggers at once! This way you can learn while you are working your way upwards and you build a portfolio of guest blog posts. Do some research: what types of posts do these blogs publish? How long is their average post? Do they take guest posts at all? What specific topics do they publish posts on? Can you create content that’s right for their audience? 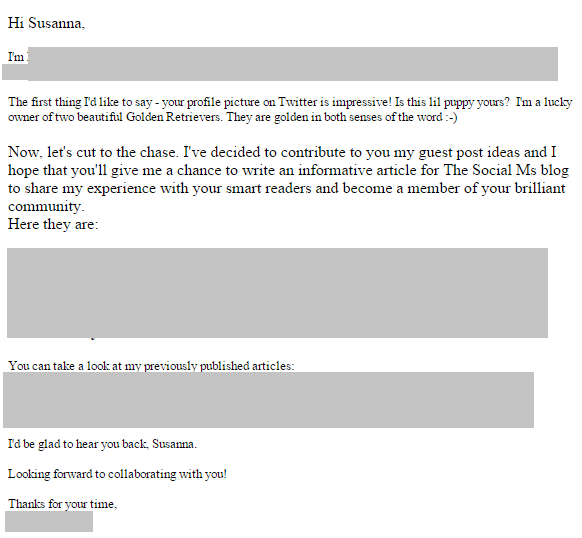 Sample guest blogging pitch, note that I removed all references to the original author. This email got bonus points for making the emotional connection via mentioning our dog. Whenever one of these blogs says yes, you should be able to deliver the actual post within 3 days. If the specific blog does not reply, you can send one follow up email 2 – 3 days later. If you don’t get a reply to that, they decided to not take your post. They need to be original. They need to fit well into the blog you want them to get published on. And they need to read well. – Does the blog you want to publish on use images in posts? Then include some images with your post. Make sure these images don’t cause problems because you don’t pen the rights! Use a tool like Canva for illustrations for instance. – Include an author bio. – Original means original. Don’t reuse parts of other posts, don’t republish your posts somewhere else. – Include real value in your posts. Guest posts need to provide a lot of value – they are not filler content for other blogs. A guest post on a specific blog needs to be at least as valuable as an average post on said blog! More is better! – Don’t try to change their minds after they said no. They won’t change their mind, but they will remember you if you do that and your chances of getting a different post published on their blog decrease dramatically. – Don’t ask for too much feedback: 99% of the time you are not going to get more than one sentence of feedback. That’s ok – giving feedback takes a lot of time, and if a blogger decided not to publish your post that is time that he/she won’t get back giving feedback creates work for the blogger – unpaid work. Don’t ask for more feedback. – Don’t send a constant stream of emails. One email and one follow-up. That’s all you get. If they don’t answer, try again in a couple of weeks. Create something you can give away for free, a cheat sheet maybe or a small ebook that is related to the topic of your post. Create a landing page on your own site where you give that freebie away in return for an email address. Link to that landing page from your guest post. A well-placed freebie in a guest post can easily give you 100s of leads from a high profile blog. 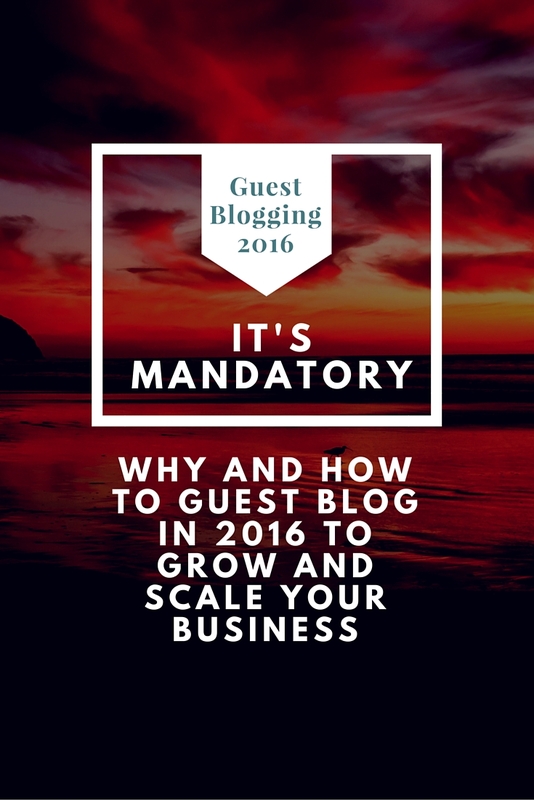 Guest Blogging continues to be a vital strategy in 2016. But what needs to be kept in mind is that a good guest blogging strategy is a lot of work. But that was always the case, even in the early days of guest blogging.